Docsvault is now available on your mobile as we launch the Docsvault Mobile Application – the most advanced way to manage your documents and tasks on the go. With more than 60% smart phone users wanting business or enterprise applications on their mobile devices, we couldn’t linger much and worked very hard to bring this simple, seamless technology to stay connected to your Docsvault information, whenever and wherever you go. Docsvault Mobile app is a client for smartphones and tablets (iOS & Android) that gives you secure access to all your documents stored on the Docsvault server in your office. You can search and view your documents (PDF, Word, Image etc.) on the go. It’s fast, secure and simple to use, so you can be productive from anywhere. 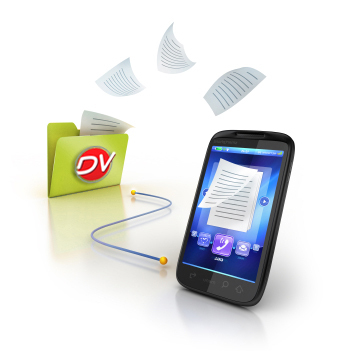 You can capture an image of the document from your phone and profile it with the Docsvault mobile app. This simple feature serves to be a magic wand when dealing with offsite paperwork, receipts, etc. In addition to this you can also create new files and folders on the go using the mobile app. Secure exchange of data through SSL connections. Only users with authorized access to the web version can log into Docsvault using the mobile app while maintaining all user & group based security intact. All the potential communication hassles with clients, team members and associates can be removed through mobile business apps as you can stay connected to them through Docsvault’s in-built feature for adding document notes, the ability to edit descriptions and other communication features. The best part about mobile technology that you are constantly updated about everything. So a potential client wants to arrange a meeting? You need not wait for someone to send across the resource material. A real-time connection with the Docsvault on-premise repository ensures that all your imperative official documents are readily available for viewing, editing and sharing. Docsvault’s commitment ‘to bring the latest technologies so as to make document management a more seamless and convenient experience for you’ stands true even today. The other popular and highly productive features of Docsvault enable us to stay true to our endeavor which is to ensure that as your business grows, Docsvault grows with you!